The elderly parents (a stern, non-communicative patriarch, and a mother who has spent most of her life in the kitchen) are visited by their two surviving adult children and their families -the daughter with her jovial husband and two young children, and the younger son with his wife and step-son. The son, in his early 40s, is anxious to avoid revealing to his parents that he is currently out of work, and is frustrated at being in the shadow of his deceased older brother, his father’s heir. 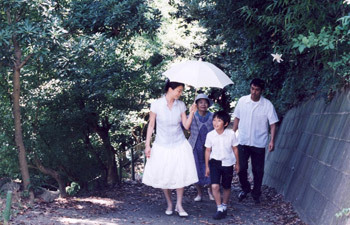 On their way, near the start of the film, he discusses with his wife how they can keep their visit as short as possible. Hirokazu Kore-eda (writer, director and editor) has said in interviews that he was inspired to make the film after his own mother’s death a few years before, and his feeling of deep regret that he had not spent more time with her towards the end of her life. Generational differences and family conflicts play out in a gentle, understated way, with moments of humour amid the tension and melancholy. Time, memory and loss seem to be the key preoccupations -the effects of past events on the present, and how what is happening now might affect future behaviour and events. Our viewing experience mirrors this in a way, as we remember earlier moments in the film and wonder how things will develop. Meaning is gained over time, and the viewer is kept constantly involved. There are few overtly dramatic moments, just wonderful observation of character, behaviour, and absorbing details, and it all has a quiet cumulative power. In many films it seems as though the environment surrounding the humans is of little or no importance, but here it is everything. The house is effectively a character in itself, and when we see the empty rooms later on it evokes a sense of loss, as we remember the human interaction we’ve seen in these spaces earlier in the film. Household objects and possessions are used to reveal the psychology of the characters, and family differences are intermingled with the sharing of simple pleasures -such as eating the mother’s special corn fritters. In these moments, connecting on a basic level through shared experiences, the personal agendas and mental barriers lessen to varying degrees and the characters seem most ‘alive’. Much has been written about this film being inspired by the work of Yasujiro Ozu (Tokyo Story especially), but Kore-eda himself has stated that while it shares similar themes and motifs (including more than one passing train! ), in terms of technique he was more inspired by Mikio Naruse and Ken Loach. It is certainly less formally rigid than Ozu, who mostly kept the camera near to the ground with a 50mm lens. Kore-eda does keep camera movements to a minimum (thereby giving them more power), and keeps the framing mostly static, but that is about as far as the comparison goes. His use of telephoto lenses effectively compresses space and gives the impression the characters are walking slowly. The editing is also striking, often allowing characters to enter and leave the shot, thereby giving more prominence to the space around them and evoking a sense of time passing. Kore-eda discusses his stylistic approach to the film in an interview with the AV Club. Still Walking has something to offer everyone, and I cannot recommend it enough. It doesn’t offer any revelations, but is profoundly moving and ultimately uplifting because of its truthfulness. Wow, what a beautiful review Robin. Very interesting to have your film-maker’s eye on it and glad you liked it. Tokyo Story is coming up @ The Barn in March as it happens. Looking forward to regular reviews.